The study of budo, or the Japanese martial arts for self-cultivation, is a lifelong path toward perfection of character. 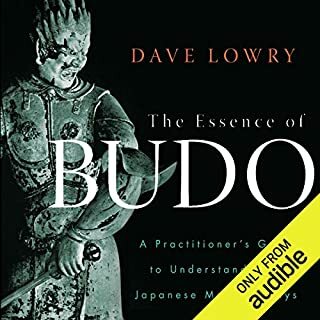 Here, Dave Lowry, a sword master who has practiced and taught budo for over 40 years, addresses the myriad issues, vagaries, and inconsistencies that arise for students of karate-do, judo, kendo, kenjutsu, aikido, and iaido as their training develops. I just sat in a Dojo of the mind. Ryokan (1758–1831) is, along with Dogen and Hakuin, one of the three giants of Zen in Japan. But unlike his two renowned colleagues, Ryokan was a societal dropout, living mostly as a hermit and a beggar. He was never head of a monastery or temple. He liked playing with children. He had no dharma heir. Even so, people recognized the depth of his realization, and he was sought out by people of all walks of life for the teaching to be experienced in just being around him. This classic teaching by a Tibetan master continues to inspire both beginners and long-time practitioners of Buddhist meditation. 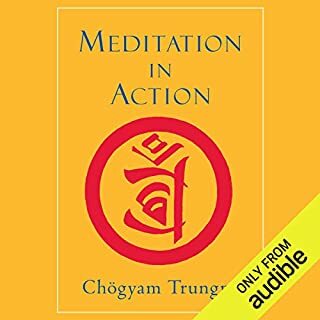 Chgyam Trungpa Rinpoche shows that meditation extends beyond the formal practice of sitting to build the foundation for compassion, awareness, and creativity in all aspects of life. He explores the six activities associated with meditation in action - generosity, discipline, patience, energy, clarity, and wisdom - revealing that through simple, direct experience, one can attain real wisdom. 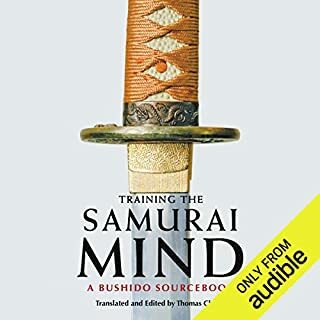 Training the Samurai Mind gives an insider's view of the samurai world: the moral and psychological development of the warrior, the ethical standards they were meant to uphold, their training in both martial arts and strategy, and the enormous role that the traditions of Shintoism, Buddhism, Confucianism, and Taoism had in influencing samurai ideals. Under the guidance of such celebrated masters as Ed Parker and the immortal Bruce Lee, Joe Hyams vividly recounts his more than twenty-five years of experience in the martial arts. 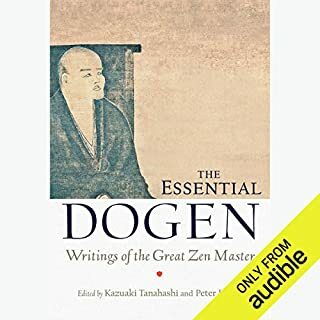 In his illuminating story, Hyams reveals to listeners how the daily application of Zen principles not only developed his physical expertise but gave him the mental discipline to control his personal problems - self-image, work pressure, competition. The Complete Book of Five Rings is an authoritative version of Musashi's classic The Book of Five Rings, translated and annotated by a modern martial arts master, Kenji Tokitsu. Tokitsu has spent most of his life researching the legendary samurai swordsman and his works, and in this book he illuminates this seminal text, along with several other works by Musashi. Best translation I have encountered. Written in the 13th century by Japanese Zen master Muju. Well-known koans in the collection include "A Cup of Tea", "The Sound of One Hand", "No Water", "No Moon", and "Everything Is Best". Includes the soundtrack The Mysterious Sound of Wind in the Bamboo - a 43 minute collection of Zen-inspired Japanese music by The Matsu Take Ensemble. The paradox of awareness is very profound and yet very simple. It can't be described because it has no objective qualities and no limitation. Sometimes it comes naturally to the surface when we are fully in the present moment and no longer lost in thought or mental projections. Pure consciousness is neither high nor low, neither pleasant nor unpleasant, neither good nor bad. No matter where we are, no matter what we are doing, we always have an immediate access to that inner stillness. Chögyam Trungpa offers us a vision of moving beyond fear to discover the innate bravery, trust, and delight in life that lies at the core of our being. Drawing on the Shambhala Buddhist teachings, he explains how we can each become a spiritual warrior: a person who faces each moment of life with openness and fearlessness. "The ultimate definition of bravery is not being afraid of who you are," writes Chögyam Trungpa. In this audiobook, he offers the insights and strategies to claim victory over fear. Bushido. This one word contains a wealth of meaning. Honor and grace, strength and compassion, loyalty and vengeance. Bushido is the warrior code of the samurai, a standard of conduct and an unwritten guide for right behavior and attitude. It is the core principle of ethics in Japan, an ideal that extends into every aspect of life and character. Zen is a way of life, a religion, and an aesthetic, as well as one of the oldest and most profound religious philosophies in the world. This program presents selections from some of the best-known works in the Zen canon. 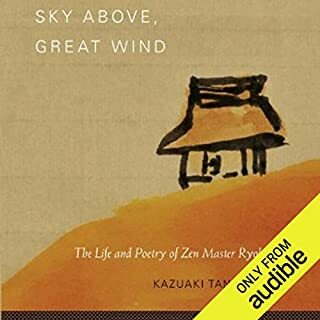 101 Zen Stories recounts actual experiences with Zen spanning five centuries. The Gateless Gate is a 13th-century collection of mind problems used in the practice of Zen. 10 Bulls is a 12th-century commentary on the stages of awareness leading to enlightenment. In 81 brief chapters, Lao Tzu's Tao Te Ching, or Book of the Way, provides advice that imparts balance and perspective, as well as a serene and generous spirit. It teaches us how to work for the good with the effortless skill that comes from being in accord with the Tao: the basic principle of the universe. During his lifetime, legendary martial artist Bruce Lee formulated a complex personal philosophy - a synthesis of Eastern and Western ideals - that extolled the virtues of knowledge and total mastery of one's self. Most of his philosophical writings could be found only within the personal library of the Bruce Lee estate - until John Little was given permission to publish them for the wider world. The inspirational teachings in this collection show that the real way of the warrior is based on compassion, wisdom, fearlessness, and love of nature. The teachings are drawn from the talks and writings of Morihei Ueshiba, founder of the popular Japanese martial art of Aikido, a mind-body discipline he called the "Art of Peace", which offers a nonviolent way to victory in the face of conflict. Ueshiba believed that Aikido principles could be applied to all the challenges we face in life - in personal relationships, as we interact with society, and at work and in business. This edition is a much-expanded version of the original miniature edition that appeared in the Shambhala Pocket Classics series. It features a wealth of new material, including a biography of Ueshiba; an essay by John Stevens that presents Ueshiba's views on "The Art of War versus the Art of Peace"; newly translated doka, didactic "Poems of the Way"; and Ueshiba's own calligraphies. ©2002 John Stevens (P)2016 Audible, Inc. If you are at conflict with yourself on trying to be a warrior,but not filled with rage and anger. This book is very enlightening and helps you understand the way to pushing beyond that conflicting ideology. Peace is not an accident. Peace is a choice. The most far-seeing warrior resolves conflict before harm even becomes an option. The most far-seeing healer resolves imbalances before the slightest evidence of symptoms. This should be on every person's book list. Whether relatable or not, it is material that should be experienced. I recommend to every kind of reader. it felt like a great translation and a very wonderful book thank you. I will probably listen to it again and again. This book delves into the reasoning behind the creation of the martial art. Well and somewhat indepthly portrayed. I would recommend this book to anyone interested in a better understanding of the martial arts which they find intriguing, interesting or somewhat fascinating. Excellent narrative. Perfect pronunciation and historical content. I laughed and cried, goosebumped from head to toe, and felt the warm current of chi welling up then circulating within me. I have wanted to study Aikido for years, and now I know why. This has been exactly my thought process concerning the martial arts throughout my practice and study. I will continue to re-listen to O'Sensei's timeless wisdom over and over. Truly a priceless treasure. What about Brian Nishii’s performance did you like? 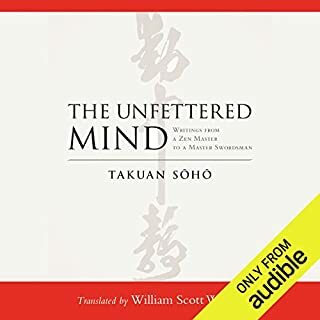 Brian Nishii takes the performance very seriously, which makes the audio version of this foundational book enjoyable to listen to. His performance is an asset to the piece. I was reading a thing called Deserata..and I always wanted to find something that would go into more detail..this seemed to fill that need! A great read that is full of wisdom. I'm glad I read it. Now I'm going to read it again. Good but heavy on the spiritual mumbo-jumbo. 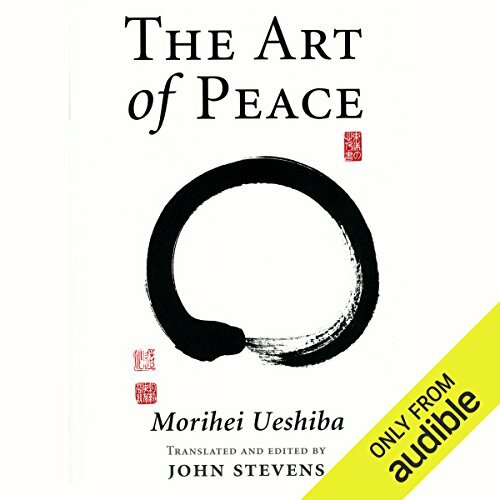 I decided to go with the Audio book as it had a few extra chapters, like the life of the founder and the comparison between Ueshiba's Art of Peace to its counterpart - Art of War. Unfortunately the comparison chapter seemed very lackluster I was expecting direct differences, why Art of War is incorrect both practically and spiritually as well as why Art of Peace is the best option, other than the spiritual mumbo-jumbo being: Art of Peace is the Universe. I do enjoy some spiritual stuff but this is very heavy on it for a new-comer. But the early chapters on Morihei Ueshiba's life was very enjoyable as well as some of the actual "Art of Peace" quotes etc were enjoyable, again some need to be taken with a pinch of salt unless you really want to buy into the universe is inside us vibe. Other than that though, enjoyable and somewhat eye-opening. The story starts off will and is very interesting but dragged on a bit at the end.